Do you need a skintervention before springtime? I do. Although we’ve having a pretty warm winter so far (hope I won’t jinx it now), the temperatures in London are lower than in Italy, and my skin doesn’t like it. Not one bit. It’s drier and feels tighter than usual. 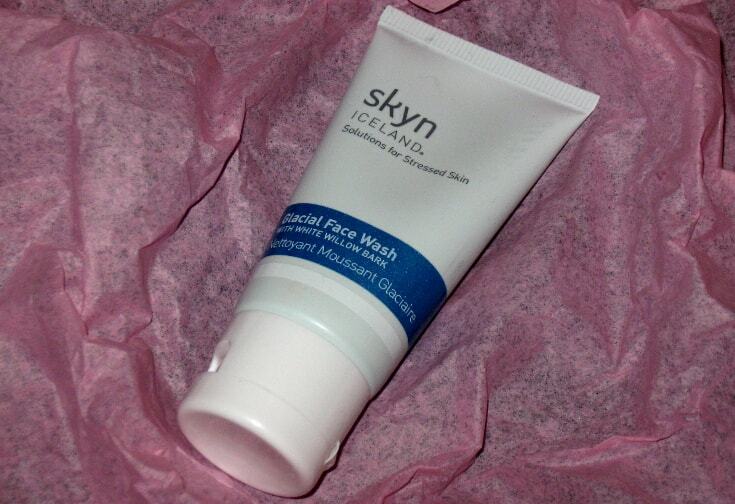 So, you can imagine my relief and curiosity when I was handed the Skyn Iceland Winter Rehab Kit. Created by Sarah Kugelman after she took a trip to arctic Iceland to recover from stress, the line is designed to replenish the skin with the harsh nutrients harsh weather strips away from it, and keep it hydrated, luminous, and soft during the long, cold, winter months. The Glacial Face Wash is a creamy cleanser that leaves skin squeaky clean. Really squeaky clean. I wouldn’t say it dries out my skin, but it does strip a bit more natural oil from it than most cleansers do. That’s not surprising. The cleanser contains potassium hydroxide (also known as lye), a powerful cleansing agent that easily removes everything from the skin. The catch? It’s highly alkaline (read: can cause irritations if you have sensitive skin). Needless to say, it shouldn’t be used around the eyes. Potassium hydroxide may do the heavy lifting, but sodium methyl cocoyl taurate helps too. Much gentler, this surfactant produces a nice leather. I believe that, and glycerin, a humectant that hydrates skin by attracting water from the environment into it, help counteract the harshness of lye, so it doesn’t irritate skin (unless it’s very dry or sensitive). Because the Glacial Face Wash is so powerful, you only need to use a tiny pea size amount for the entire face and neck. That means the big bottle (mine is a sample) will last you for ages. Oh, I almost forgot to mention. It feels very refreshing on the skin, which is so pleasant, even in winter. 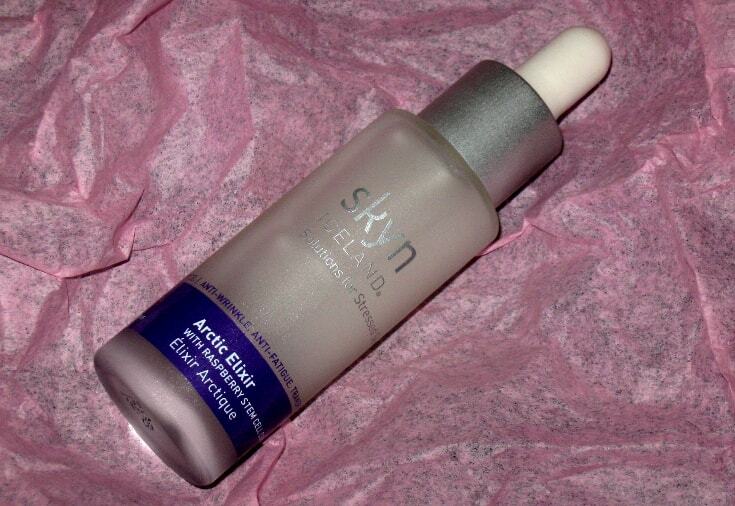 The Arctic Elixir is a lightweight, but highly hydrating serum. It contains both glycerin and sodium hyaluronate, a humectant that can bind up to 1000 times its weight in water, and works well even in arctic climate conditions. Together, they keep skin hydrated, supple, and soft to the touch. The serum is also formulated with “groundbreaking” raspberry stem cells. If you’re a regular reader here, you know that stem cells don’t work. Not as claimed, anyway. A stem cell from raspberry can’t regenerate human skin. But it can provide antioxidant properties. And you can never go wrong with antioxidants. They help our skin fight the free radicals that cause premature wrinkles and damage the DNA. In addition to raspberry stem cells, the serum also contains thyme and rosemary extracts, and a bunch of natural oils from berries and jojoba that have both antioxidants and moisturizing properties. Unfortunately the bottle, which comes with a drop applicator, is see-through, so I’m not sure for how long the antioxidant properties of the serum will last. But, the burst of moisture it provides is much needed after the Glacial Face Wash stripped a bit too much of it from my skin. I also noticed it gave my face a subtle glow. The Icelandic Relief Eye Pen is a portable moisturizer you can easily carry with you wherever you go. To make the product come out, just turn the end of the pen. Of course, the first time you do this, you have to turn, and turn, and turn, and turn some more before the cream deigns to make an appearance. And then, it comes out all at once, wasting product. From the second time on, though, you only have to turn it once to release just the right amount of product you need to cover the small eye area. White in colour, the cream is lightweight and fast-absorbing, leaving skin softer and smoother. Glycerin and a bunch of synthetic emollients (I won’t bore you with their incomprehensible names) keep skin hydrated and supple. Dimethicone, a silicone that doesn’t suffocate skin, fills in fine lines and wrinkles, so they look smaller. Thyme and other naturally-derived antioxidants help prevent further damage. Aloe vera provides some soothing relief. And then, there’s phytonadione, the complicated, hard-to-remember name for vitamin K. This vitamins plays an important role in the circulation process (it helps blood to clot), which is why it’s often used in eye creams. Studies have shown that it can indeed reduce the appearance of dark circles. The catch? The tested cream also contained retinol, so we don’t know how big (or small) a role vitamin K plays in reducing dark circles when used alone. Instead, I’m less thrilled to see menthyl lactate in the ingredient list. It’s a form of menthol that can cause irritation. It’s further down the label, so I doubt it’ll cause problems to anyone but those with the most sensitive of skins. The Pure Cloud Cream is a light-as-a-cloud moisturizer. This one too sinks into the skin really fast, providing both moisturizing, soothing, and (for a while) antioxidant properties. Sodium Hyaluronate attracts water into the skin. Sweet almond and canola oils create a protective film that keeps it there, naturally moisturizing your skin for hours. And moisturized skin = smoother, plumper, and younger-looking skin. The cream also contains a bunch of soothing ingredients, like bisabobol, oat extract, and aloe vera that relieve the symptoms of irritations and itchiness. It’d be wonderful for sensitive skin if it didn’t also contain alcohol. But this is listed almost at the end of the ingredient list, so the other soothing agents should be able to easily counteract the potential irritation it may cause. My biggest problem with this cream, though, is with the packaging. Pure Cloud Cream is packed with retinol, and vitamin C and E, which have all been proven to reduce the signs of aging, like wrinkles and sun spots. Unfortunately, they’re very delicate and lose a bit of their effectiveness every time they’re exposed to light and air. That’s why a bigger version of the sample tube rather than a jar would have been much, much more appropriate. 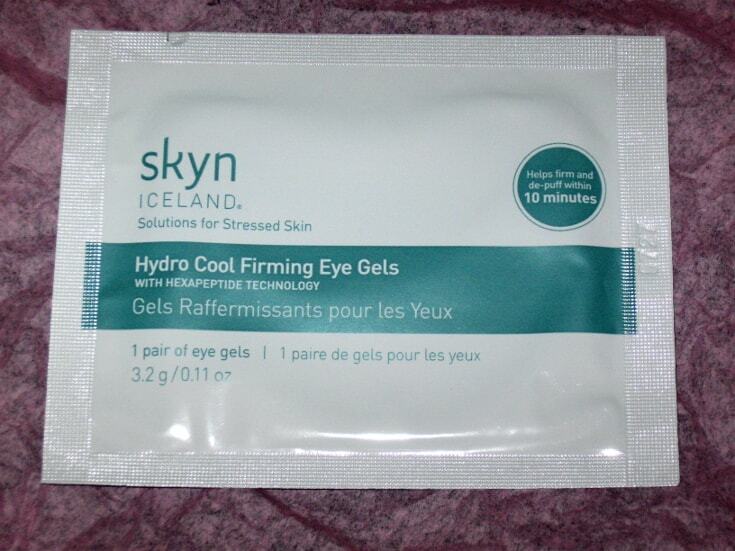 The last product in the kit is the Hydro Cool Firming Eye Gels. These adhesive patches are huge, fitting nicely under the eye area (and beyond!). The first thing I noticed when I put it on was the tightness. It felt like I couldn’t move my skin at all, which was a bit uncomfortable. The tightness is due to acrylates copolymer, a film forming agent used to keep hair in place. In skincare products, it provides a film that “tightens” the eye area, which helps reduce the appearance of wrinkles and flatten the fad pads that cause eye puffiness. Of course the results are only temporary. It’s a quick-fix, not a long-term solution. But, the effect is truly amazing. I tried the old wives’ remedies such as cucumbers and tea bags, but nothing reduced my bags this quickly. After 10 minutes, my undereye area looked a lot smoother, was a lot softer (thanks to olive oil and glycerin), and free of puffiness. These Eye Gels aren’t part of my daily skincare routine, but come in handy on those days when I had a poor night’s sleep, or I have a special occasion to go to. I’ll have to stock up on these for those emergencies. The Winter Rehab Kit is a great introduction to the brand. It’s perfect for plane travelling, as well. It fits nicely into your carry on, and will keep your skin hydrated throughout the flight, and give it a youthful glow too. Pros: All the products have lightweight, but highly hydrating textures that sink quickly into the skin; The serum and moisturizers left my skin softer, smoother, and brighter; The Hydro Cool Firming Eye Gels relieves undereye puffiness in just 10 minutes; Easy to travel with. Cons: The Glacial Face Wash can be drying; The Arctic Elixir and Pure Cloud Cream aren’t properly packaged to keep the antioxidants in them stable; The Glacial Face Wash and Icelandic Relief Eye Pen aren’t suitable for sensitive skin. Summary: Easy to carry everywhere with you, Skyn Iceland Winter Rehab Kit contains serums and moisturizers that deeply hydrate skin, leaving it softer, smoother, and brighter. The Hydro Cool Firming Eye Gels also depuff the undereye area in just 10 minutes. However, the Glacial Face Wash can be drying, and not all products are correctly packaged to keep the antioxidants stable and effective for long.